In 1994, Shakti Innovations was founded "to design products that improve the performance of electromagnetic components in the automotive and audio worlds through a unique patented process that absorbs and dissipates what is commonly referred to as Electromagnetic Interference (EMI)." On the audio front, as I recall, their first product was the Shakti Stone, a three-circuit electromagnetic stabilizer that was well received by those willing to open their ears. In 1997, they introduced Shakti On-Lines, which took a circuit adapted from the Stone and put it in a compact unit that could be velcro'd on cables or attached to internal circuit parts. On the automotive front, things began to get serious in 2000. Still operating from the conviction that "wherever EMI can be reduced, signal transfer is improved and the concurrent performance benefits are realized by the end user," Shakti went on to demonstrate that placing one On-Line at each of the ignition coils of a stock Chevy Tahoe and VW Golf produced faster 0-to-60 times and an increase in horsepower. According to the technician who ran the test on the Tahoe, the "almost 4/10th of a second faster time would usually cost between $2,000 and $3,000 in engine modifications." Cost of the eight On-Lines for the Chevy? $400 retail. Smiling faces all around? Priceless. The Hallographs were introduced, if I recall correctly, at CES in 2003. I guess you could describe them as a complementary approach to the signal transfer improvement quest. Even though I missed that room at the show, I didn't fail to notice the attention the devices garnered from some writers at the time. 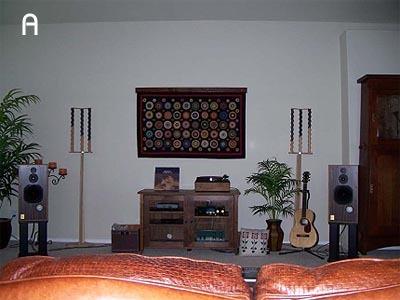 Somewhat curious but far from motivated -- having just spent a bundle on ASC room treatments to tame the space from audio hell in the new house she whom I adore just had to have -- I disregarded the ephemeral thought. Besides, I'd previously purchased a trio of Argent RoomLenses after penning that review for TAS. Given all that -- the purchase of the house, the move into the room of torment and the expense of treating it with the ASC devices -- let's just say that I felt amply tweaked out. Okay, besides all that and my curiosity, I was skeptical. Surely some form of mass brainwashing had occurred at CES. 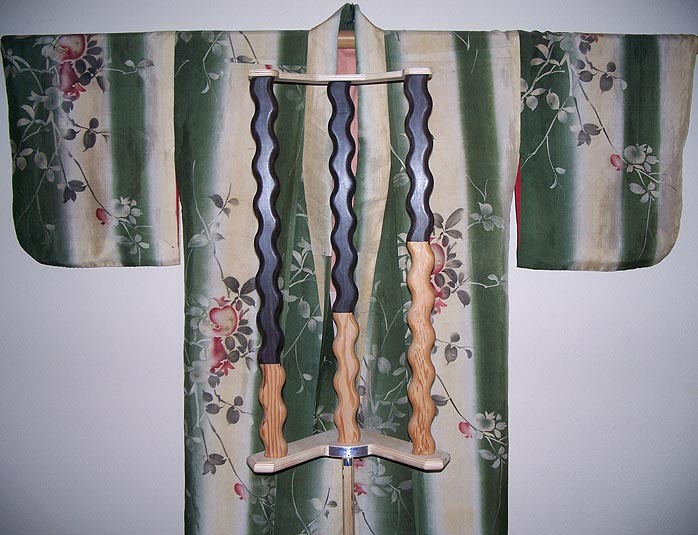 How could these sylphlike sticks perform as claimed? The operating principle behind the RoomLens was easy for me to understand. 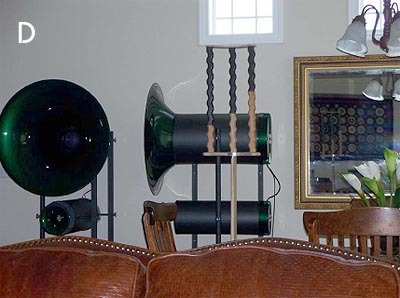 According to their now defunct website, "the Argent RoomLens is a feedback-controlled modified broadband Helmholtz resonator that damps unwanted room resonance while positively reinforcing and focusing the true sound of the system ..." When compared to the minimal mass of the Hallographs, the RoomLens were physically large enough and appropriately constructed to pull off said feat. As I wrote in my review, "They're tall, they're dark, they're relatively handsome five-foot devices made of three open-ended, internally-damped tubes set in a heavy base with adjustable feet. The RoomLens system was represented as producing, "an effective counter resonance to the generated energy, allowing you to focus and characterize the acoustic image in a room-complimentary fashion."" As Paul Candy noted in his review of them, "When the RoomLenses were properly situated, the orchestra became more layered and focused. Brass and percussion shifted further back into the depth of the stage and woodwinds were more defined. Big timpani whacks were tauter and went lower. The soundstage was also slightly wider and airier, with more space around instruments. A slight bit of hash on the upper registry of massed stringed instruments was removed to make them fuller and rounder in tone." Let's see - increased stage depth (and width when properly placed), improved bottom end response, a bit more air and ambience plus focus and definition. Yeah, that pretty much sums up my experience with them, too. Back on point, when I cast my eyes on the comparatively minute mass of materials employed in the construction of the Hallographs, I wondered how they could possibly do anything to alter the sound of my system. And that's my lame story. I let the opportunity pass. Over the course of several years, my lovely bride remodeled and upgraded the house. Did I mention it was new when we bought it? Did I mention it was already finished? Did I mention. .. never mind. And she thinks my quest is expensive. Fancy that! In early 2005, we decided that we would move (crikey!) to accommodate her then very ill mother living with us. We'd have to go from our two-story to a rambler so she could get around. All in all, it worked out well for everyone. Mom got her own suite, I got a better listening room and you know who got a new project of her own: Another house to upgrade! This is the part where you'd like me to explain how the Hallographs work. Not gonna happen. We'll need some help on that front so please read on. Then comes the part where you'd expect me to describe their impact. That'll work. I'll give that a go. Shortly. 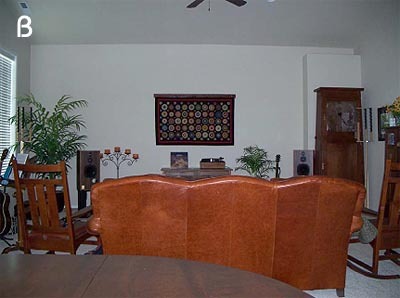 But first, a description from the Shakti website: "The Hallograph Soundfield Optimizer consists of two arrays that are easily placed behind each speaker near the corners of the back wall. Each array is engineered with proprietary technology (patent pending) and made with exotic hardwoods, consisting of staggered activated panels that are mounted on an elegant base that beautifully blends into any style room environment. "The Hallograph breakthrough technology is the result of over 10 years of research that studied the effects of the speaker/room interface. We learned how to reduce the audibility of the chaotic reflections from the walls of the listening room so they won't overpower and interfere with the direct sound from the speakers. The Hallograph contours the frequency, amplitude and time coefficients of the first reflections you hear, which produces a stunning increase in realism." Good stuff, huh? Let me just say here and now that stunning realism were not the words that hit me upon first listen. And thankfully so because I've become immediately leery of gear that stuns me. The very first word that came to mind was 'natural'. If you're not sure what to make of that, let's just say that in my world, 'natural' is better. Before I say more, just let me add that I was promptly addicted. But, I was also discontent with the rather thin explanation on the Shakti website. So after listening and just before finalizing this review, I dialed the number on the screen and was greeted by Ben Piazza. Once he found out what I was up to, he asked me to make sure that Dave Caplan also got credit for the work, making him the coinventor. Done. With that out of the way, I noted that there was a White Paper on their site about the Shakti Stone but not the Hallographs. I asked if he could tell me more than what little already on the web, which was really just a marketing blurb. "Sure. Basically, they swamp room noise by becoming the primary indirect sound source. Think of them as passive loudspeakers that modify the ambient field response." * The instructions are clear but as a repetitively diagnosed oppositional defiant, I don't deal well with authority. 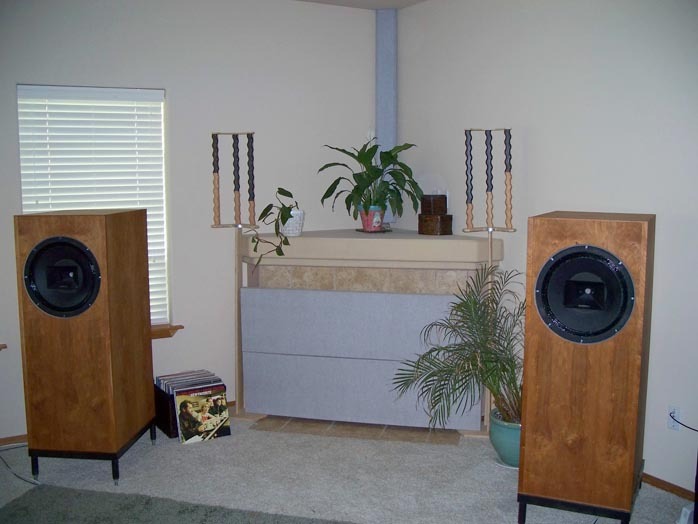 behind the front speakers in typical listening rooms. In some situations where there is none or only one corner, then symmetrical placement, again behind and to the outside of each speaker, is the correct placement." A second (side) pair "can be used as a versatile equalizing tool to modify some recordings to suit one's taste. A recording that seems too dry is instantly livened up with a slight rotation more toward the listener. Conversely, too bright or hot a recording can be warmed up with a toe away from the listener. The Primary Pair can also provide some equalization but it is the Side ones that provide the greatest range." Larger rooms are said to benefit from a third (rear) pair to "add a natural ambient decay as heard in concert halls or clubs and adds a final subtle touch of realism to the experience." Ben went on to talk about the construction, using four types of wood and an innovative design that led to an industry first: A combination reflector and diffuser. He then munificently went on to disclose some in-depth insights from the yet-to-be-published White Paper on the Hallographs. What makes the Hallographs unique? "It's the intentional contouring of the reflection signal and the high level of diffusion from such a small surface area. As I mentioned earlier, the Hallograph is almost like a secondary speaker that to some degree decouples the primary speaker from the room. Instead of softening the room sounds, which requires extensive materials and treatment, we tried to produce a musically complimentary device that dominates what the listener hears as the earliest reflections. "The direct energy from the speakers already contains the ambient cues the microphones picked up at the recording site but the room modifies the image, writing over its own signature and ambient cues. So, while we can't eliminate the room, we can reduce the perception of it to some degree by introducing a new boundary that is designed as a diffuser, one that has superior geometry to the room's flat surfaces. "Typical reflector/diffusers use a single type of wood and/or absorbent material mounted against each other. Let's call these the paddle type. The diffusion in these types is generated from the asymmetrical depth of the pieces in relation to each other. Hallographs use a spaced, undulated and rounded-over fork type geometry to achieve the asymmetry essential to produce diffusion. In addition, there are four different types of wood used in our product. Our open fork design has double diffusion because the return wave off the wall is sent through the diffusers a second time unlike with the paddle type. 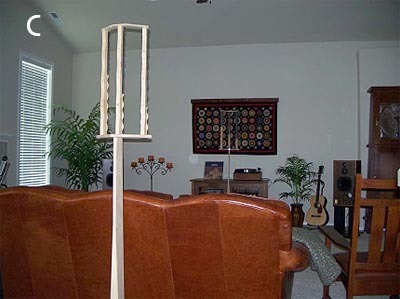 If you think of the secondary sound waves in a room as water moving chaotically in all directions, this fork type diffuser has a much more powerful smoothing effect per square inch than the paddle type diffusers. That makes it akin to a powerful propeller that the water, or in this case the sound waves, go through to smooth out their peaks. 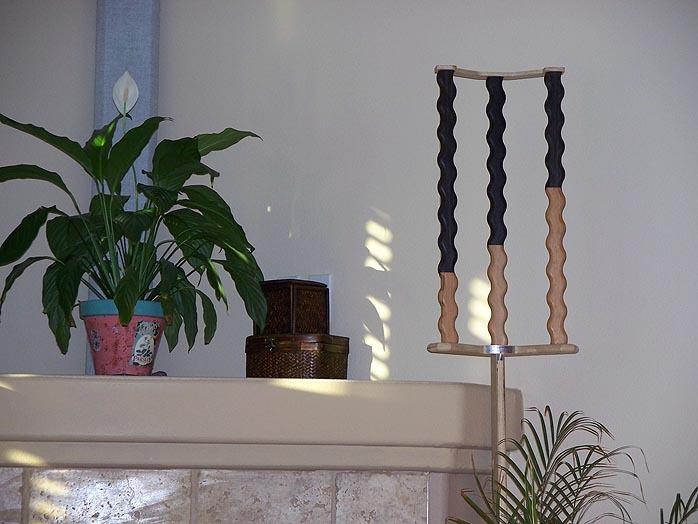 Our diffuser has 60 undulations per channel and rounded-over edges that multiply the surface diffusion taking place. Unlike paddle type diffusers, which require many more panels, one pair of Hallographs can have a dramatic effect." That did create a helpful mental image but I had to ask, how do they accomplish the bass control I experienced? 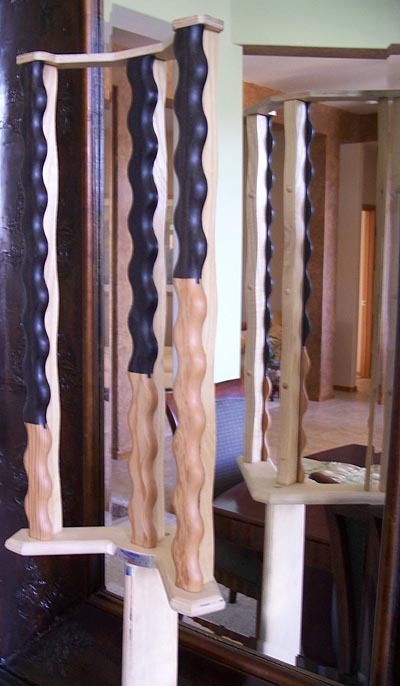 "Our stand, which is 4 feet in length, is also asymmetrical and does produce some audible improvement in bass clarity. Again, the goal is to push the room's enormously distorting effects further into the background with a far more neutral ambient soundfield. The reflector material in the Hallograph consists of several types of wood that all have different resonant signatures. All the wood lengths are staggered on the three reflectors. Each reflector has a flat surface that gently curves into a round-over section. These interlaced but geometrically different surfaces have a striking effect. The Hallograph's own direct return energy (from the flat portion of the reflector) and its ambient signals (from the curved reflector area) impact the sonic envelope one hears. This ratio of direct to ambient surface tuning, just as is the case in a concert hall, restores a more natural hall acoustic. So, the inherent differences from recording to recording are no longer stamped with the listener's room signature. Instead, the various original venues are heard far more realistically. Behind each reflector is a chamber that modifies the frequency response, amplitude and most importantly, the time signature of the reflector. This creates a complimentary interface between the speaker and the room." What do you mean when you talk about the time coefficient? "This is also known as the time signature; how long a given material goes on ringing once it is activated by sound waves striking it. In the chambers behind each reflector, we 'treat' the time signature so it has a much shorter ring than the material a room's walls are made of. This treatment also affects the frequency response, which has a direct correlation with the time signature character. Amplitude is manipulated by the choice of wood, diffusion geometry of the design and additional treatment that will be explained in the patent." Speaking of which, what about the choice of woods? "The black African wood potion of the Shakti reflector has a tight pore structure. It's more like metal in its speed of return of sound as compared to a room's walls. Imagine you were standing on some railroad tracks four miles from a train coming and I was only two miles away but not on the tracks. You, though twice as far away, would hear the train before I did because of the faster transfer of sound through the metal rails." I know you did some objective data collection on the Shakti On-lines. Any plans for evaluating the Hallographs? "Well, it's true about the On-Lines. And over the years, we have had a lot of people come and listen to the Hallographs. Many walk away scratching their heads. Most ask where the black box is. Others need a stiff drink! We are hoping to collaborate with a research university in the near future to do what you are describing. In fact, any engineer out there who can help us quantify the Hallographs would get a free pair or two. "In the meantime, did you know that digital engineers have come in to listen? They comment that the Hallographs reduce the perception of crosstalk, something they are accustomed to addressing electronically. It is well known that stereo positioning of two loudspeakers produces crosstalk or left and right channel bleed around the face of the listener. The Hallographs seem to be reducing this, by reinforcing the amplitude of the hard left or hard right miked instrument or voice and we think the speed and short ring off the Hallograph is a contributing factor to this benefit." The Hallographs and the RoomLens do bring about some similar effects to differing degrees. The former seem to open the soundstage and the room when placed in corners behind speakers while the latter tend to alter the soundstage only. The influence of the Shaktis immediately swept my being back to my time with the Harmonix RTA-78 room tuning devices when I wrote: "... I'm mostly intrigued by a heightened sense of space. Not the space inherent in the recording itself (which is excellent), but the feeling that my listening room walls have migrated outward. And, the space behind the speakers is slightly illuminated, with some previously unrecognized energy." 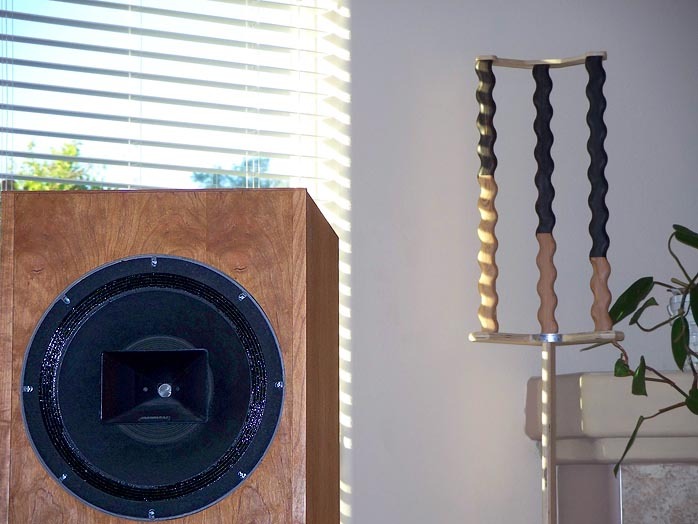 Yes, the RoomLenses also energize the space behind the speakers, however they do so by providing more focus and definition and do so with less liquidity (that connecting-the-dots-of micro-events thang versus a focus dot after dot). If you're so inclined, you may place one (or more) of either product behind you to pull you into the performance, but I found that effect kinda creepy with both products. guard when it comes to diminishing inappropriate clinginess of sound to speakers. Each also brings out more detail that can clue us in to the acoustic space in recordings. The big surprise for me (I had gotten used to it with the RoomLens), was the ability of the Hallographs to tighten up bass. It simply seems physically impossible but -- as several members of the Bad Boy Benevolent Association will attest -- I'm not the only one who experienced that outcome. While most people will use the Hallographs outside and behind the speakers, my favorite position is just inside and about three feet behind. Sacrilege! Hey, you do what works. More specifically, you do what works for you - to get what you like. It's your system and your priorities. Remember that you are creating your Absolute Sound because the Absolute Sound is a fairy tale. That said, I took the devices over to fellow moonster Jeff's place for an afternoon of audio games. Pete Riggle and Bill VanWinkle were already there when I arrived. Here's the Reader's Digest version of what transpired. B. Two feet behind and various distances outside the plane of the speakers. C. One immediately behind and centered between the speakers and one just a foot behind the listener. D. One immediately behind and centered between the speakers and one ten feet behind the listener. E. Both devices removed from the room. With setup A, Pete immediately noticed a difference and stated that the sense of space increased significantly. Bill concurred. Jeff simply observed. With setup B, Bill noted less liquidity and less tonal saturation than with A but was sure it was still better than E. Pete, on the other hand, described improved mid-bass and sense of overall spaciousness. Jeff just grinned. When I centered the units in front and directly behind the listening position C, Pete wasn't sure and Bill said he noticed nothing. Jeff's eyes got bigger. Placing one of the devices 10 feet back of the listening position elicited a "Wow!" from Pete. He noted that the impact on the bass register was positive and appeared to tighten up the upper bass. Bill agreed. Jeff said nothing. In the end, Bill (who, for you newcomers, is a blind piano tuner) preferred A over B and E but found A to be much better. Pete chose B for the absolute spaciousness factor and upper-bass attenuation. Then our dear Jeff finally chimed in. He liked A for the tonal density factor and found it more spacious than E while offering more body, less treble glare and a much more natural presentation overall. impressed! They delivered what they promised. I really like the flexibility of tuning you can get by moving them around the room. Most importantly, they made the sound more natural - smoother, with more harmonic decay. Everything was less etched, less hifi. It's one of the few tweaks I'd be willing to pay money for myself." That last statement startled me. I've known Jeff for many years now. He's pretty resistant to tweaks even when they make significant improvements. Case in point: A few years back I was reviewing Bob Benn's Sound Engineering LLP Outsider Record Weight for TAS. More than a weight, it acts like a flywheel and more than that, it makes musically meaningful improvements to vinyl playback. We tried it in my system and Jeff's. He agreed with my conclusions but didn't think it was a good value at $500. I was more than ready to shell out the green. liquidity and persuasive presence they coax from the string of boxes in my system. The return on investment is a no-brainer for me. As for you know who, the significant other approval factor is even less than a non-issue. She likes them! I think it's fair to say that we both recommend them.